Winners of both the First Prize and Amadeus Prize at the London International String Quartet Competition, Formosa Quartet is "one of the very best quartets of their generation" (David Soyer, cellist, Guarneri Quartet). Hailed as "spellbinding" (BBC Music Magazine) and "remarkably fine" (Gramophone), Formosa has given critically acclaimed performances at the Ravinia Festival, the Caramoor Festival, the Library of Congress, the Da Camera Society of Los Angeles, the Chicago Cultural Center, the Walter Reade Theater at Lincoln Center, Rice University, San Francisco State University, and London's Wigmore Hall, and has recorded on the EMI, New World Records, and Delos labels. Formed in 2002 when the four founding members came together for a concert tour of Taiwan, Formosa Quartet is deeply committed to championing Taiwanese music and promoting the arts in the land of its heritage, as well as exploring diverse and adventurous mediums for string quartet. 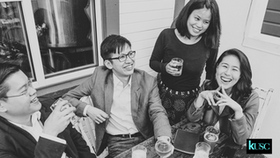 In 2013 the members of Formosa Quartet founded the annual Formosa Chamber Music Festival (FCMF), where they continue to serve as artist faculty. Based in Hualien, Taiwan, and modeled after American summer festivals such as Marlboro, Ravinia, the Taos School of Music, and Kneisel Hall, FCMF is the result of collective long-held aspirations and years of planning and represents one of the Quartet's primary missions: to bring high-level chamber music training to talented young musicians in Taiwan, while simultaneously offering first-rate music to Taiwanese audiences of all ages. Formosa Quartet undertakes a variety of residencies at organizations and institutions across the U.S. and Canada. In 2014-2016 Formosa enjoyed a two-year residency with Art of Élan, a San Diego arts-presenting organization; as ensemble-in-residence, the Quartet worked with UCSD professor of composition Lei Liang to create a new piece based on music indigenous to the aboriginal tribes of Taiwan. The two-year project culminated in the 2016 premiere performance of the commission, Song Recollections, and looks ahead to a new CD of the same name, inspired by Hungarian and Taiwanese folk music traditions. Formosa also became the faculty quartet-in-residence at the National Youth Orchestra of Canada in 2014, has been a returning collaborator with Taiwan Studies / Taiwan Lecture Series at UCSD and with composer Shih-Hui Chen at Rice University, and looks forward to an upcoming week-long residency of educational and artistic outreach at Eastern Michigan University. Formosa Quartet has played a leading role in actively commissioning new works, contributing significantly to the modern string quartet repertory, including the premiere of Taiwanese-American composer Shih-Hui Chen's Returning Souls: Four Pieces on Three Formosan Amis Legends in 2014, and the Quartet's recording of its first commission from Ms. Chen, Fantasia on the Theme of Plum Blossom, released on the New World Records label. Other pieces composed for the Quartet include three pieces by Dana Wilson - Hungarian Folk Songs, The night of h's, and Apart - Wei-Chieh Lin's Pasibutbut and Five Taiwanese Folk Songs, and Thomas Oboe Lee's Piano Quintet and Jasmine Variations. The members of Formosa Quartet – Jasmine Lin, Wayne Lee, Che-Yen Chen, and Deborah Pae – have established themselves as leading solo, chamber, and orchestral musicians. With degrees from the Juilliard School, Curtis Institute of Music, and New England Conservatory, they have performed in major venues throughout the United States, Asia, and Europe, and have been top prizewinners in prestigious competitions such as the Paganini, Primrose, Fischoff, Naumburg, and Tertis competitions. As chamber musicians, they have appeared regularly at the Marlboro, Kingston, Santa Fe, Ottawa, Ravinia, Crans-Montana, and Schiermonnikoog festivals, as well as at the Chamber Music Society of Lincoln Center, La Jolla Summerfest, the Seattle Chamber Music Society, and Open Chamber Music at Prussia Cove. 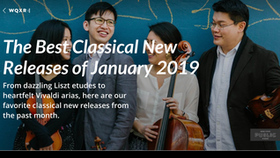 The members of Formosa Quartet are currently faculty at the University of California at Los Angeles, and Eastern Michigan University, the University of Illinois at Urbana-Champaign, and Roosevelt University. They have previously held principal positions in the San Diego and Cincinnati Symphonies as well as faculty positions at the University of Southern California, California State University Fullerton, Taos School of Music, McGill University, and the Juilliard School. Formosa Quartet forms an octet with violins Joseph Curtin (2001) and Andrea Guarneri (1662), an Enrico Catenari viola (1680), and a Vincenzo Postiglione cello (1885).